Cassel Sharpe knows he's been used as an assassin, but he's trying to put all that behind him. He's trying to be good, even though he grew up in a family of con artists and cheating comes as easily as breathing to him. He's trying to do the right thing, even though the girl he loves is inextricably connected with crime. And he's trying to convince himself that working for the Feds is smart, even though he's been raised to believe the government is the enemy. But with a mother on the lam, the girl he loves about to take her place in the Mob and new secrets coming to light, the line between what's right and what's wrong becomes increasingly blurred. When the Feds ask Cassel to do the one thing he said he would never do again, he needs to sort out what's a con and what's truth. In a dangerous game and with his life on the line, Cassel may have to make his biggest gamble yet - this time on love. After reading WHITE CAT and RED GLOVE--and absolutely loving both of them--I couldn't wait to get stuck into the last book in the Curse Workers trilogy. Cassel Sharpe doesn't lead the easiest life. He lives in a world where everyone wears gloves because some people can affect others with a simple touch of their hand. These people are called Workers, and he comes from a family who happen to be just that. They're also con artists, masters of manipulation, and compulsive liars. Actually, his brothers used him as an assassin without his knowledge for years. And now, he's working for the Feds. Well, he's decided he'll sign up with them after he graduates from Wallingford Preparatory. As much as he's trying to be a good member of society, the poor guy keeps getting dragged into messy situations. So when he finds out his mother is being kept by Zacharov until the Ressurection Diamond she stole from him is found, he's got no choice but to investigate. When the Feds need his special kind of power to be used on a governor who is making too much noise about controlling workers, his life is put on the line because he knows he can't trust anyone. After so many cons and lies, will the biggest stunt end up being the death of him? 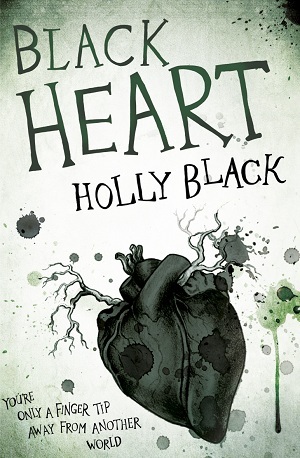 Black Heart was another heart-stopping, brilliant book that had me on the edge of my seat--especially towards the end--because I couldn't wait to see how it would all turn out. It's another amazing installment to this intriguing trilogy, which reaches a very satisfying end, but made me sad when it was over. I'm going to miss Cassel and his easy manner of unintentionally slipping from one lie to another, waiting for the next con, and still trying to be different from the rest of his family. I absolutely LOVED this book, and recommend the trilogy to anyone who enjoys a great story!